The Stockholm police special team headed by Alex Recht returns in Silenced, the sequel to Unwanted. Alex's team is small comprising civilian Fredrika, the promising but sexist Peder and a newcomer Joar. After Fredrika's performance in Unwanted she is now accepted in the team (and the tiresome attitudes against her have gone). Heavily pregnant and not feeling well she is on reduced hours so Joar is brought in. He and Peder do not get on particularly well at the beginning and their relationship deteriorates. The team are handed two cases both of which may not be murder but are a bit fishy. One is a hit-and-run and the other a murder-suicide of a vicar and his wife resulting from the death of one of their daughters. The team must locate the couple's other daughter to break the bad news. When it's discovered that the vicar was a passionate supporter of helping immigrants and had even hidden illegal entrants to the country in his home in the past, then the investigation initially focusses on a right-wing group. Meanwhile the hit-and-run victim had some scraps of paper with Arabic on them. Are the two cases linked and if they are, how? And where is the missing daughter? Interspersed in the Stockholm sections are chapters from an unidentified Swedish woman in Thailand who is in deep trouble; her identity's being erased and she's trapped. As well as the police investigation and the Thailand segments, time is spent on the personal lives of the main players in the team in particular Fredrika and her unusual domestic set-up, Peder with his immature behaviour and Alex whose wife seems to be hiding something from him. 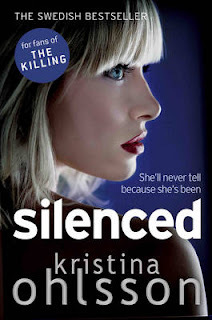 Silenced is an entertaining and easy read, the 468 pages fly by, helped partly by a large print size and wide margins but mainly by the unravelling of a complex story with its several unforeseen twists. The police investigation is handled better than in Unwanted (with phone records and unlimited surveillance teams apparently readily and immediately available) and it all takes place over a breathless few days. Ohlsson likes to put her characters through the emotional ringer so there are a couple of shocks at the end of the book, one has more impact than the other due to the time invested in the affected parties. Fans of Kjell Eriksson should enjoy Kristina Ohlsson's books with their mix of domestic, professional and political issues.